Celiac disease is an inflammatory disease that affects an estimated 3 million people in the United States, but that number could be higher. Approximately 17 percent of those who have it have been misdiagnosed with other conditions, or remain undiagnosed. With those who have celiac disease, time is of the essence—considering the other disorders that can be triggered by celiac disease, their condition could become worse without the proper treatments. Getting the right diagnosis as soon as possible is of the highest importance so that the correct course of treatment can begin. Your healthcare provider can work with you to discuss medications, diet, and supplementation to replace nutrients that aren’t easily absorbed by the digestive system. If you’ve been diagnosed with celiac disease, IBD, Crohn’s disease, ulcerative colitis, or malabsorption conditions, talk to your doctor about Forvia. Forvia by Inovera Bioscience is a multivitamin/mineral product that can be helpful those who can’t absorb nutrients from their diet. It comes in tablet and chewable forms, and is designed to be gentle to the digestive system. Celiac disease falls under the classification of being an autoimmune disorder. This means your body’s immune response (white blood cells and antibodies) attacks healthy cells rather than the infections they’re designed to attack. In celiac disease, these immune cells attack the digestive tract, specifically the small intestines, leading to a number of symptoms that can be very uncomfortable, or even become life-threatening. While celiac disease and irritable bowel syndrome (IBS) have some similarities, they are not the same condition. IBS is one of the conditions that those who have celiac disease are commonly misdiagnosed with. One of the key differences is that IBS affects the colon, where celiac affects the small intestines. 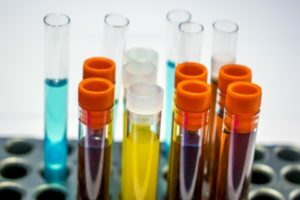 If a person has been diagnosed with IBS but isn’t finding relief, further investigation could be warranted to determine if they do, in fact, have celiac disease. Researchers have found several contributing factors to celiac, including genetics, but a specific cause hasn’t yet been pinpointed. Some find that their disease becomes triggered after events such as pregnancy and childbirth, surgery, viral infections, endocrine disorders, prolonged stress, and even head trauma. It can flare up any time in life, from childhood through adulthood. Another cause is high consumption of bread. Those who have celiac disease must follow a gluten-free diet (more on that below!) to avoid painful flare-ups. Gluten is a protein found in wheat and other grains that is responsible for causing the effects of this inflammatory disease. While it might seem like a pretty big undertaking to avoid gluten altogether, there are, in fact, numerous alternatives! You can work with your healthcare provider and/or a nutritionist to discuss the best way to plan your meals to avoid gluten. If you suspect you might have celiac or another type of inflammatory bowel disorder, speak with your healthcare provider right away. You will want to begin to keep a journal of your food, your symptoms, and other observations to discuss. Discuss any concerns you have about not absorbing enough nutrients from food as well. If you’re not getting all the nutrition you need from the foods you eat, you can consider taking a supplement that is highly absorbable, such as Forvia. Buy it online only at Inovera Bioscience today! You might have found this page because you’re wondering if it’s possible you have undiagnosed celiac disease. While we can’t possibly replace any information your doctor can provide you, we will go over the signs and symptoms of celiac disease so you can arm yourself with more data to take to your healthcare provider. In order to get a proper celiac disease diagnosis, you will want to be as thorough as possible. It might be helpful for you to keep a journal that tracks your symptoms, the foods you eat, and other information, including any treatments you tried (over the counter medications or changes of diet, for example). Here are some of the symptoms of celiac disease to be on the lookout for. Keep in mind that not everybody will experience the same exact symptoms or severity. Diarrhea can be loose or even liquid in consistency, and happen frequently when flare-ups occur. It can be painful because of spasms, gas, bloating, and cramping. Those with celiac disease might find that they experience urgency frequently, and the loss of water through the bowels can lead to dehydration. On the other hand, some with celiac disease experience constipation. The stools can become “stopped up” become incredibly hard in the colon, and then become extremely difficult to pass. This can cause quite a bit of pain and discomfort. Gas and bloating can occur on its own, or accompany diarrhea. Some people find that their entire belly visibly swells after they consume gluten, and it becomes tight and painful. Celiac disease causes malabsorption of the nutrients we should be getting from the foods we eat. When you’re not getting enough nutrients, you body isn’t able to properly break down carbohydrates, fats, and proteins you consume to use as energy. One of the hallmarks of autoimmune disorders is that they cause inflammation. The joints are especially susceptible to this inflammation, and it can result in pain, loss of movement, and other discomfort. If you’re not getting the nutrients your body needs to support healthy tissues, your bone density can suffer. Some of the symptoms of bone loss can include sensitivity, easy breaks, pain in the spine, and even loss of height. Irritability in adults can stem from a number of the symptoms they’re experiencing—many of us tend to get cranky when we’re experiencing a lack of sleep and are in pain! Depression can result of these as well, but also as a result of a celiac diagnosis…or even the unknown when they have undiagnosed celiac disease. However, when it comes to children, they are sometimes not able to clearly articulate their feelings, and end up being chronically crabby. In order to get a proper celiac diagnosis, you will need to visit your healthcare provider, who can then discuss your possible celiac symptoms and concerns. If malabsorption is a concern, discuss taking Forvia, a non-prescription multivitamin/mineral supplement that’s designed to be highly absorbable. Inovera Bioscience created Forvia with malabsorption conditions in mind, using ingredients that not only absorb better, but that also are less likely to be irritating to the digestive tract. Learn more about Forvia, and order yours today! What is a Celiac Attack? Even those who have been diagnosed with celiac disease experience celiac attacks. This can happen because they ate food that was not labeled correctly, from cross-contamination, or even a moment where they opted to take “just one bite” of something. 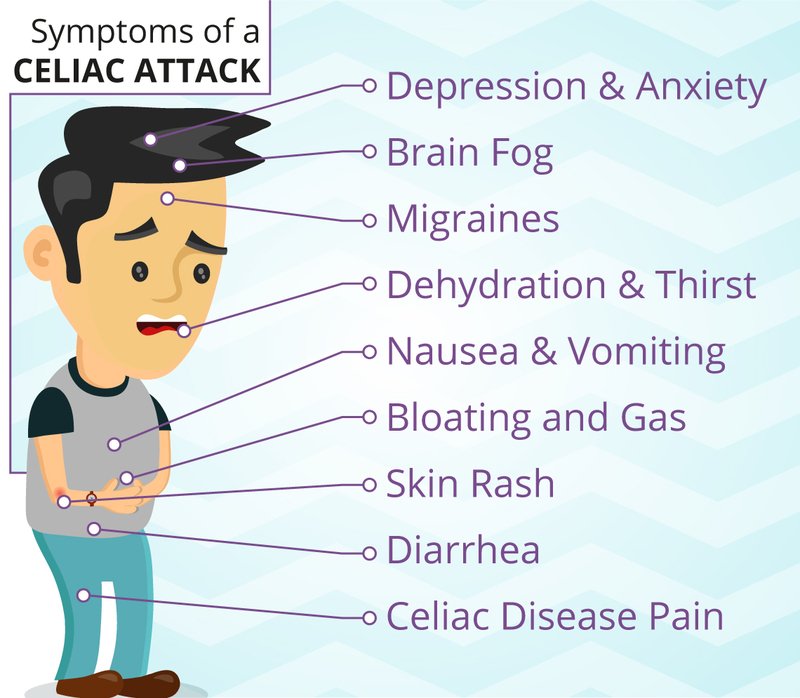 Regardless of the circumstances, the consequences of a celiac attack can be incredibly painful and cause a lot of digestive discomfort. When a celiac patient has consumed gluten, it’s not a matter of taking a pill that will fix the issue. Oftentimes, the attack can last for several hours, and even lead to a trip to their physician or to the emergency room. To help you better understand what can happen during this type of flare-up, we’ve put together a guide to some of the symptoms. Bloating and gas may occur after somebody is exposed to gluten. Some report discomfort and mild symptoms. However, some may see visible abdominal swelling, to the point that they look pregnant. Celiac disease bloating can come in a range of severity from person to person, and from flare-up to flareup. When your body ingests something it perceives to be poison, its first instinct is to expel it. Gluten can be identified as a poison by the body, and as a result, nausea and vomiting can occur. This can last from hours to even days for some people. Diarrhea is another way your body quickly expels harmful substances from the body. If somebody has been “glutened” they will likely experience abdominal cramping and loose, watery diarrhea. Vomiting and diarrhea can cause dehydration, so it’s important to do your best to stay hydrated, even if it seems you’re going to throw up anyway. Taking small sips of water throughout can help. Celiac is an autoimmune disease, and one of the classic symptoms of this classification of conditions is the brain fog. They can experience difficulty doing everyday tasks, concentrating, paying attention, remembering things, word finding, and finding creativity. A rash is the body’s way of showing you that it’s experiencing inflammation. While some causes of rash are from touching something, this rash comes from the inside. The celiac rash is itchy, red, and can be found on the back of the neck, buttocks, elbows, and knees. In addition to the pain experienced from digestive issues and rash, those who have celiac disease can experience pain all over the body. Even something as innocuous-sounding as a comforting touch or hug can cause severe pain. Those with celiac disease and gluten sensitivity have a much higher incidence of having migraines. A connection has also been found between consuming gluten and having migraines, so maintaining a gluten-free diet can help lessen the incidence of migraine attacks and headaches. Research has revealed a connection between gluten and depression and anxiety. Many patients report anxiety attacks that go along with eating foods that contain gluten. Depression can happen as a result of eating a gluten-rich diet, but also as a result of having celiac disease. If you suspect you have celiac disease, seeking a diagnosis is your first step. Learn more from your healthcare provider to help you better manage your diet and attacks. And if malabsorption of nutrients from food is a concern, discuss taking Forvia. It is rich in the nutrients your body has a hard time absorbing, and is gentle to the stomach. It comes in tablet and chewable forms, and is only available from Inovera Bioscience. Buy yours today. Once you’ve had your celiac disease properly diagnosed, you will want to start treating it. You might work with one physician, or a number of healthcare providers, to move forward with living with celiac disease. Celiac treatments can vary from person to person, depending on varying factors that are individual to your specific case. 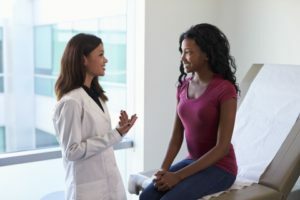 When you’re discussing celiac disease treatment with your physician or healthcare provider, make sure you understand fully why you’re undergoing each type of treatment. Here are some of the ways your celiac disease could be treated. Talk to your dietitian to discuss all the specific grains to avoid. In addition to avoiding these grains, you will need to scrutinize everything you ingest because gluten is an additive in so many products—even non-food products. Sometimes it is disguised as ingredients such as starch, food stabilizers, and other types of preservatives. It can also be found in supplements, vitamins, and medications you take. Cosmetics can also contain gluten, as well as dental hygiene products that you don’t necessarily eat but that you ingest indirectly. The glues used on stamps and envelopes can even trigger an attack! You will have to be diligent about finding the hidden gluten in the products you use, and work with your healthcare providers to learn more about where to find gluten in the world around you. Whether you work with a dietitian, nutritionist, or physician who specializes in food allergies, getting your diet right is critical. In addition to eating gluten-free and learning what foods have hidden gluten in them, you will need to focus on foods that promote healing. Your intestinal villi especially need to heal. More than that, getting enough fiber, calcium, B vitamins, vitamin D, zinc, magnesium, and iron without gluten-containing grains is tricky since so many grain-based foods are fortified with these nutrients. Finding just the right formulation is important to your health and healing process and this, as well as any other celiac treatments you’re considering, should be discussed with your provider. Forvia by Inovera Bioscience is formulated with those who have celiac, IBD, Crohn’s, ulcerative colitis, and other malabsorption conditions in mind. It is gluten-free and lactose-free, and is also free of fillers, dyes, artificial sweeteners, and flavors. For those who have difficulty swallowing tablets, we have created a chewable form in addition to the tablets. Forvia is formulated to be highly absorbable, and its nutrients were chosen to complement each other for the best possible use by the body. It doesn’t need a prescription, although we recommend you discuss any new medication or supplement you take with your healthcare providers first. We manufacture all our supplements in the United States using only the highest quality ingredients possible, and we are rigorously inspected and laboratory-tested to ensure the strictest level of quality. If you are living with celiac disease and are looking for supplements to help you, talk to your healthcare provider about Forvia today! Now that you’ve learned more about celiac disease and gluten intolerance, you might be wondering what the difference is between celiac disease, gluten intolerance, and a gluten allergy, as well as a handful of other similar conditions. While all three of these terms mean a person has a reaction to gluten (inflammation of the stomach and intestines, most commonly), these conditions have a few key differences you should know about—this is why getting an accurate diagnosis is especially important! 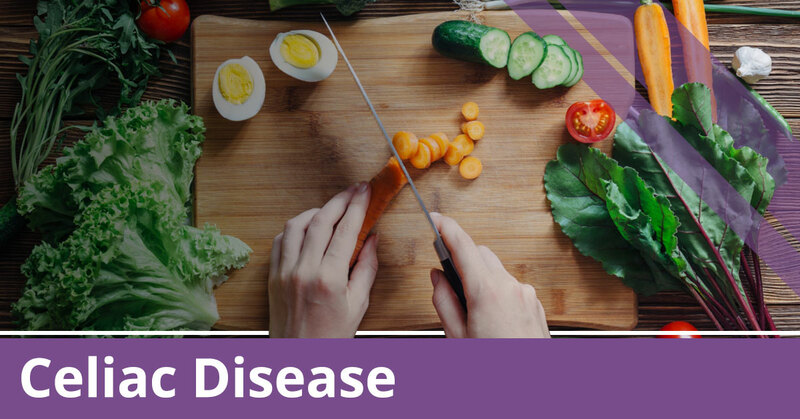 Celiac disease is an autoimmune disease wherein the body attacks its own intestinal cells. The body’s own immune system causes this reaction, and gluten itself doesn’t do the damage. With celiac disease can come other autoimmune conditions, such as type 1 diabetes, thyroid disease, Hashimoto’s, and so on. 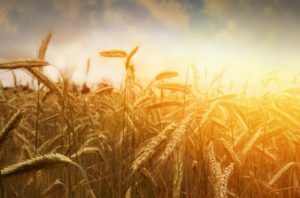 Gluten challenge – if you are currently on a gluten-free diet, your healthcare provider may have you reintroduce gluten-containing foods, stimulating the production of antibodies in your blood. Gluten intolerance can also be called non-celiac gluten sensitivity. While it’s not an autoimmune disease, your body does have a strong response to ingesting gluten. Gluten intolerance symptoms are similar to celiac, and can include diarrhea, bloating, cramping, and pain. However, one of the key differences is that the intestines do not become damaged. People who suffer from gluten intolerance lack the right enzymes to properly digest gluten, so it should be avoided. A wheat or gluten allergy means that when you consume wheat or gluten-containing foods (depending on your specific diagnosis), your body’s immune system kicks into gear. While you might experience inflammation of the stomach and intestines as a result, the symptoms typically reside fairly quickly. In some cases, you could experience anaphylaxis, skin rashes, difficulty breathing, nasal congestion, and vomiting. Because of the complexity of each of these conditions, those who suspect they have symptoms for any of these should consult with a healthcare provider rather than self-diagnosing. In addition to the tests that could be performed, your provider will do a full workup, discuss your health history, and take into consideration any other symptoms you have noted. Before you visit your provider, it might be helpful to keep a journal of the foods you eat, as well as the symptoms and observations you make from day to day. Knowing specifically what your condition is will make a substantial difference in the way you’re treated. Because a gluten or wheat allergy can cause anaphylaxis, you might receive a prescription for an EpiPen or epinephrine, which is something that you wouldn’t need for celiac disease. And if it’s only wheat you’re allergic to, you might not have to avoid eating everything that contains gluten. 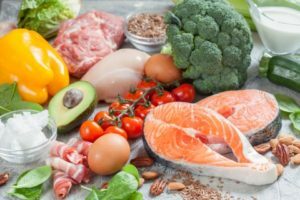 You will likely work with a dietitian, who can help you maintain the right amount of nutrition while still avoiding ingredients that trigger a reaction. If malabsorption due to a gluten allergy is a concern for you, talk to your healthcare provider about taking Forvia. Forvia is formulated to be highly absorbable for those who have malabsorption conditions such as gluten intolerance, celiac disease, Crohn’s, IBD, ulcerative colitis, and bariatric surgery. To learn more, visit our Forvia page, and ask your healthcare provider if it might be the right option for your nutritional needs.